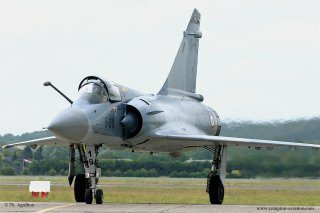 The Mirage 2000 is a sleek delta-wing jet fighter built by Dassault Aviation, and used by the French Air Force since the early 1980's. 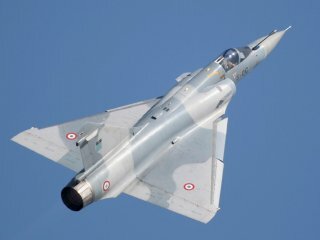 The real plane has a 9.13 meter wingspan, for 9,500 Kg take-off weight (in fighter configuration), and a maximum speed of Mach 2.35 (2,500 Km/h). Like most Dassault airplane, this one is very sleek and nice looking. Rumor has it that Marcel Dassault was fond of saying that an aiplane could not fly well unless it was beautiful. 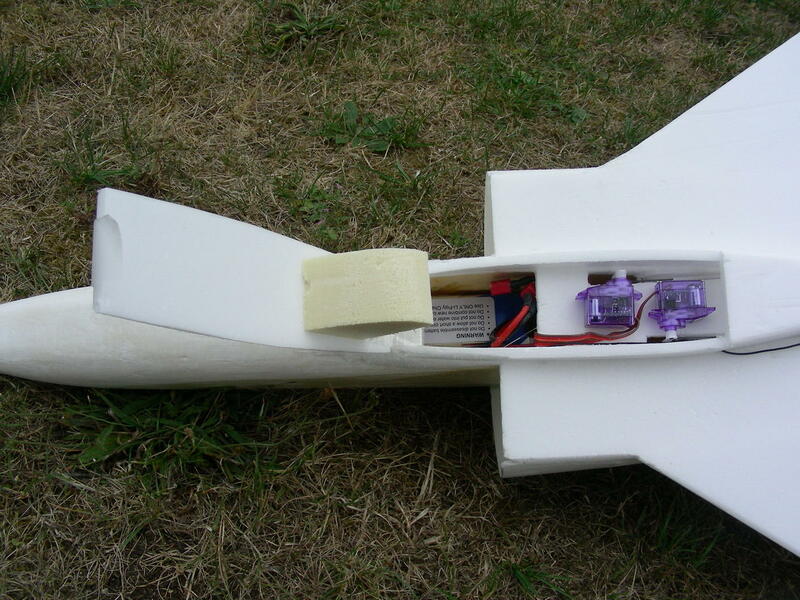 design/construction: Yann and Erwan LeCun, July 2006.
mass: 490 grams (including battery). motor: GWS EDF-65 ducted fan with Feigao 10A motor. battery: 3-cell 1800mAh Apache Lithium-Polymer. 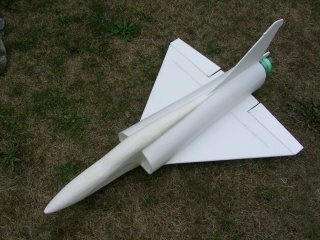 wings: flat 6mm Depron sheet, reinforced with a 4mm diameter carbon tube near the control surfaces. 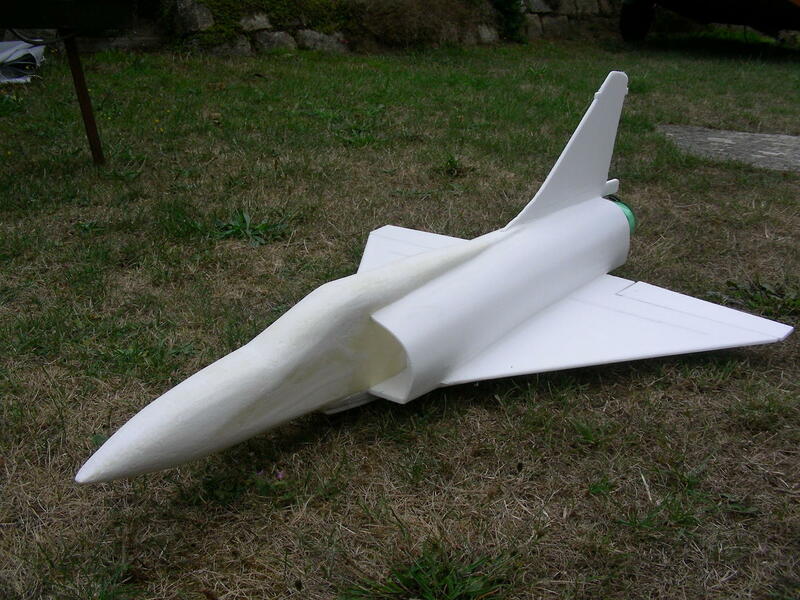 fuselage: the nose is carved in a block of yellow (urethane) foam. 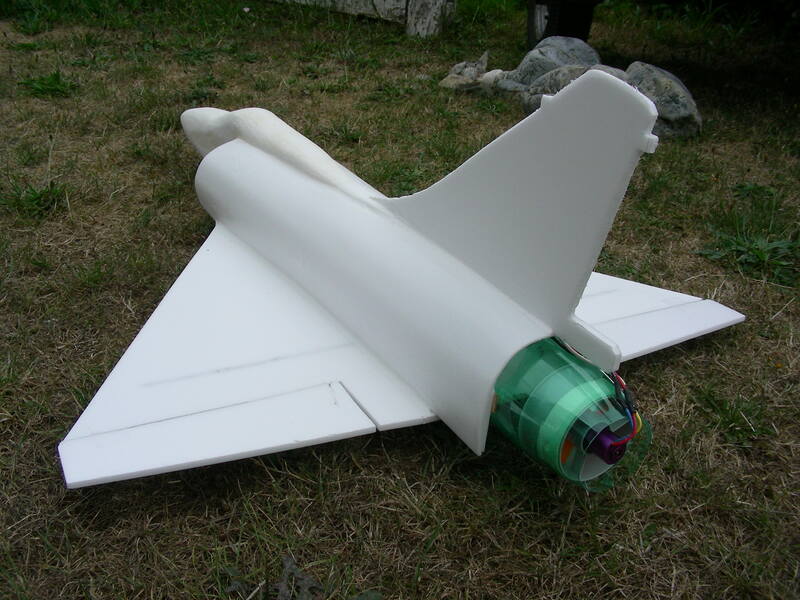 The rest of the fuselage is a 3mm depron sheet bent into shape (with the help of a heat gun). 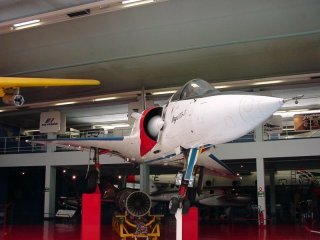 The prototype of the Mirage 2000 displayed at the Musee de l'Air et de l'Espace in Le Bourget, near Paris (click on the photo for more pictures taken at the museum). The wing is a single sheet of 6mm Depron that goes all the way to the front of the turbines. Two flanks make of 6mm Depron are glued to the top of the wing to rigidify it, and to mark the location where the top section of the fuselage meets the wing. The battery compartment was carved out of the foam nose section with a piece of piano wire that was bolted onto a pistol-style soldering iron (replacing the regular tip). The piano wire gets hot enough to carve the foam. 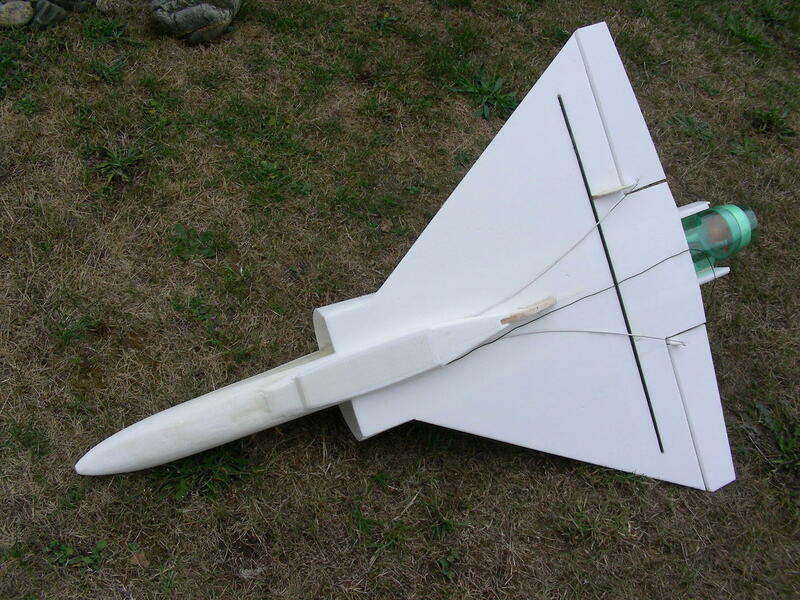 The top of the fuselage is a single sheet of 3mm depron which was bent into shape beforehand (with the help of a heat gun), and subsequently glued to the wing (and to the flanks), and to the nose section. The EDF nozzle section is cut from a plastic bottle of sparkling water (1 liter Badoit water). The plastic of those bottles is rather thick (to hold the pressure), and the design of the bottle has the perfect tapered shape to hold a ducted fan (see picture). The ducted fan is held in the bottle section with double-sided tape. The bottle section is bolted on to two long pieces of plywood. 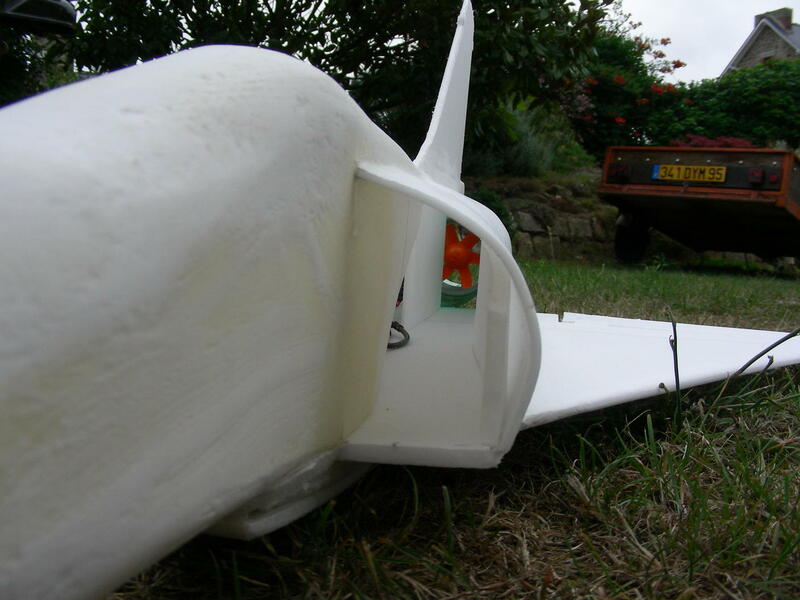 The pieces of plywood are glued to the inner surface of the flanks of the fuselage (the 6mm Depron flanks mentioned above). flight: This plane flies very well. The flight is rather gentle, due to the rather low wing loading, and the rather small motor. Nevertheless, the maximum climbing angle is quite steep. 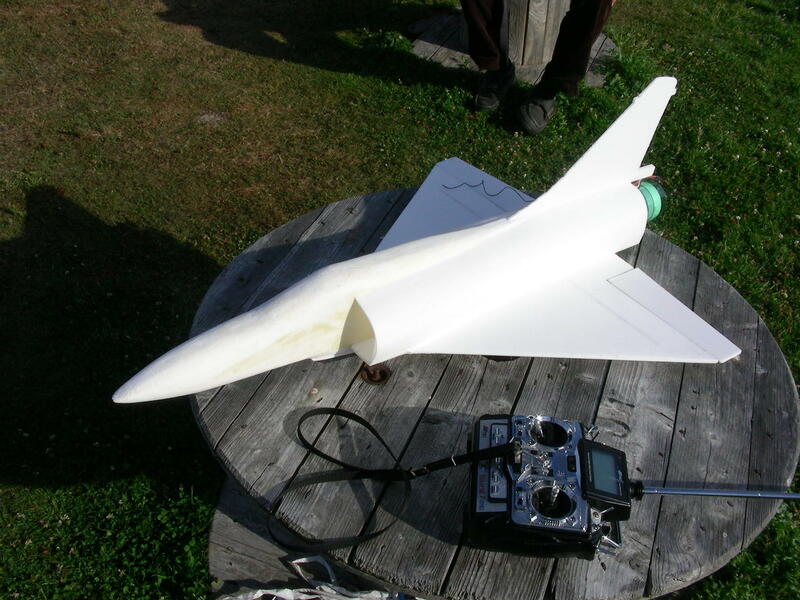 The only problem is that the motor gets very hot when the plane is flown at full throttle for long periods. Hence, I will replace the motor by a more potent one. The fun thing about delta wing planes like this one is the incredible rolling rate. There are a couple fast and slow rolls in one of the videos. These are AVI files compressed with the DivX codec. Windows users may have to download the DivX codec. Linux users can watch this with mplayer (using the lavc codec).